Dumfries & Galloway, a lush, rolling part of the UK’s countryside, is often bypassed. Tourists intent on getting north to the Scottish Highlands or south to English Lake District speed up and down the M74, leaving the ‘bit in the middle’ relatively undisturbed. They miss out on a perfect place to get away from it all, and one that boasts some excellent restaurants and hotels too. Country houses like the wonderful Knockinaam at Portpatrick or elegant Kirroughtree at Newton Stewart have been joined by restaurant with rooms, Blackaddie, reviewed here soon after it opened in 2009. At that time I reported on how the hotel was offering extremely good food and a warm welcome, but was a work in progress. I returned in spring 2012 for a second look. Blackaddie is a fine old Scottish house, set in two acres of gardens, that sits right on the banks of the Nith, one of Scotland’s best salmon rivers. 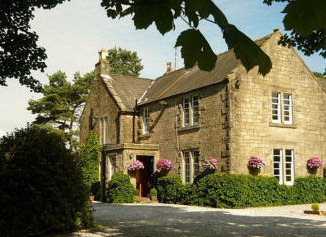 Blackaddie, with its nine bedrooms and three riverside cottages, is situated at the edge of the village of Sanquhar. For a long time it was the village pub, but late in 2007 it was taken over by Ian and Jane McAndrew, a couple with very different ambitions for Blackaddie. Ian McAndrew has a gastronomic CV that would make other chefs weep. The youngest UK chef ever to have held a Michelin star, he began life working in the kitchens of top hotels including the The Dorchester before opening his first restaurant in Canterbury, where he was awarded a star by Michelin in his first year of operation. Jane McAndrew is the formidable front of house, having had stints at London’s The Howard and The Capital hotels amongst others. Having run restaurants together in the south of England, Ian hung up his apron and the couple moved to the tranquillity of Norfolk where Ian concentrated on restaurant consultancy and writing cookbooks, including the best selling ‘A Feast of Fish’. When I first visited in 2009 Ian explained that running a fine dining restaurant with rooms was a long-term ambition. Finding the right place took time: “I didn’t want something that was already perfect,” he told me. “I saw some operations that were just beautiful and needed nothing done to them. But that’s not what we were after.” What he was after is, essentially, what he has got in Blackaddie. It is a place full of potential, trading as a busy pub but doing little to make the best of its riverside setting and the abundant, quality local produce on its doorstep. Food-wise, Blackaddie was already fully on song in 2009, but the hotel was a work in progress. Some of its nine bedrooms were very small and all were in need of modernisation. Ian explained his plan to reduce the number of rooms to six by knocking smaller rooms together, and for a complete refurbishment. Though the large scale work has yet to be done, I returned in 2012 for dinner and to see phase one: the first room to have been given a complete upgrade – and what a treat it was. The new room sets a template for an ambitious programme of renovation over the next year or two. Ian told me he the thought the food offering was “now just about right,” and indeed his reputation as a chef means a loyal band of followers make their way to this little corner of Scotland. But I confess the transformation of the new room took me by surprise: not so much a facelift as full reconstructive surgery, this huge room looking out to the hotel’s garden has a wonderfully cosseting atmosphere with its enormous super-king four-poster, deep-pile carpet and timeless mahogany furnishings. The bathroom is fully up to chic boutique hotel standards too, with acres of grey slate, Jacuzzi bath and walk-in wet room shower. Down-lighters throughout and numerous floor and wall lamps allow very configurable mood-lightning, and mod cons have not been overlooked with flat-screen multi-channel TV and wireless broadband. One thing that thankfully hasn’t changed is the homemade shortbread and Scottish tablet along with tea, coffee and mineral water. The hotel’s other rooms have yet to receive their makeovers, and currently it is fair to say they are nowhere near the standard of room number one. But they are much cheaper of course, and all are clean, comfortable and en-suite. Those looking to spend their days touring the surrounding countryside and their evenings in the bar or the restaurant will find them perfectly pleasant. And the restaurant really is what makes Blackaddie special. Blackaddie offers both a fine dining menu served in a comfortable dining room and quality bistro/bar food in another part of the hotel. We opted for the fine dining menu (of course) and perused the menu whilst sipping a glass of Champagne in the bar, accompanied by little spoons of an air-dried venison salad and croutes topped with spicy, piquant aubergine caviar. To kick off dinner, a sliver of dill-crusted cured salmon arrived as an amuse bouche. It was the perfect point at which to drain our glasses of Champagne, its firm, meaty texture gently waxy and its flavour standing up to the pungent dill and a drizzle of lemon oil. Next up, hand-dived scallops, seared and served with a cauliflower purée, gently curried cauliflower beignets and shavings of raw cauliflower floret. The dish was cleverly studded with shards of crisp pancetta and a fine fennel foam to give and array of decisive flavours and textures. We asked the charming sommelier (front of house is top notch here) to recommend a wine with this and our other starter of a lightly curried red mullet, and his choice of Viognier was spot on. My main course (right) was a triumphant symphony of beef: fillet of 28-day, dry-aged beef with a salad of Moroccan marinated seared beef and deep fried slow-braised shin of Dexter beef. Each morsel on the plate was wonderfully flavoured and deeply contrasting, the braised shin presented in a little crunchy shell of breadcrumb and coconut lined with English mustard was sensational, the Moroccan beef just seared on the outside and so juicy in the centre and the fillet creamy textured but full of flavour. A beetroot purée and horseradish foam gave punchy pinpoints of contrasting flavour. To finish, a warm carrot and walnut cake came with fennel ice cream, olive tuille and sweet carrot purée and was truly delicious, as was a selection of all Scottish cheeses served with a homemade apple jelly, candied walnuts and homemade oatcakes. The wine list is solid, kicking off around £18, with fairly standard mark-ups, and there is a small selection of ‘special wines’ that runs to Château Latour and other classic European top names. Dinner will come in at around £45 excluding drinks, which makes it very good value for this quality of cooking. As we sipped coffee and a delicious little tray of salted caramels, chocolate truffles and cinnamon doughnuts after dinner, I consider just how good this meal had been and how friendly and efficient were the front of house staff at Blackaddie. It is not a grand country house on huge estate, but a more modest and warmly welcoming bolt-hole, tucked away in a peaceful corner of Scotland (though less than 90 minutes from Edinburgh and Glasgow). Once the refurbishment has been completed it will move into a new luxury phase, but until then, even those perfectly pleasant un-refurbished rooms allow guests to indulge in one of the best dining experiences in Scotland. 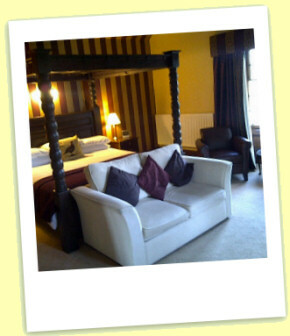 Rooms from £100 – £180 per night.